Sleep tight. Don't let the bed bugs bite" isn't just a nursery rhyme. Bed bugs are real and can infest your home. Bed Bugs are tiny insects that feed on the blood of humans and animals. Bed bugs can be found anywhere, but most commonly in areas where people sleep. Contrary to popular belief, bed bugs are not a sign of unsanitary conditions. Bed bugs can travel on people, animals, suitcases, clothing, and any other transportable item. Getting rid of bed bugs can be very frustrating if it is not done properly. ThermaPureHeat is a hassle free approach that kills bed bugs. Stop worrying and sleep better at night knowing you and your family are safe. ThermaPureHeat is the most effective solution to getting rid of bed bugs. ThermaPureHeat is chemical free and non-toxic. The system penetrates through walls and cavities to kill bed bugs. The system works by pumping odorless, dry heat into a structure or targeted area to kill the bed bugs. ThermaPureHeat will kill all the growth stages of the bed bugs, from egg to adult. This is an important benefit of ThermaPureHeat over using pesticides. Not all pesticides kill bed bug eggs. Learn more about the ThermaPureHeat process. According to ThermaPure.com, the lethal temperature for a bed bug and it's eggs is around 113°F. Bed bug adults and nymphs will die after being exposed to this temperature for 15 minutes. The eggs will die after 60 minutes of exposure. ThermaPureHeat heats the wood-core temperature of your house to the targeted temperature and sustains this temperature for a specified period of time. Fans are used to circulate the heat and maintain equal distribution. The heat penetrates walls, mattresses, bedding, furniture, electronics, woodwork, and cavities. If done properly, ThermaPureHeat kills bed bugs and their eggs in only one treatment. Alternately, extermination using pesticides can take more than one treatment and is very toxic. ThermaPureHeat is safer and more effective than using chemicals. No chemicals. No threat to your home or the environment. No odors. No harm to pets. Ability to penetrate inaccessible areas. When done properly, only one treatment is needed. Studies done by the University of Massachusetts have found that when using pesticides, 68% of all bed bug infestations require three or more pesticide treatments, 26% require two pesticide treatments, and only 6% require one pesticide treatment. View videos showcasing the use of ThermaPureHeat in killing bed bugs. 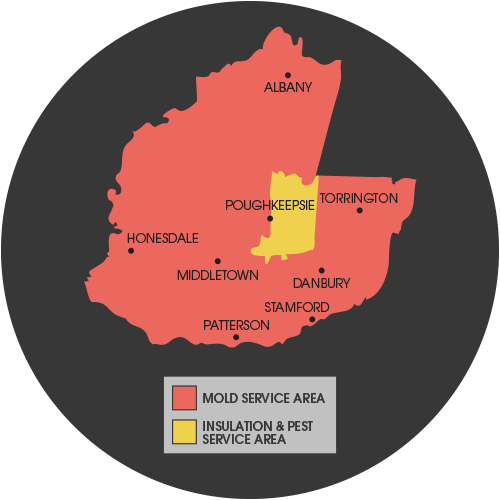 We offer free bed bug inspections in Poughkeepsie and to homeowners in the surrounding areas in New York. Contact us today, and you'll be one step closer to a safe, healthy home.